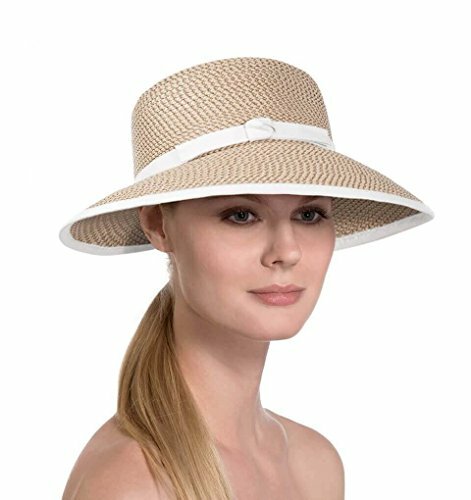 Eric Javits developed this Squishee® hat banded in grosgrain to provide maximum sun protection for the face, neck and ears. The brim is cut wider than those on most caps for added coverage. Headsize adjusts with the Velcro® tab in back. Removable terry forehead pad is machine washable. Lightweight and packable. Blocks 95% UVA/UVB rays. Look your best while you enjoy the sun! Independent testing in accordance with AATCC (American Association of Textile Chemists and Colorists) test methods have determined this product's effectiveness for blocking ultraviolet radiation as well as UVA/UVB radiation. This product was awarded the highest rating of 50+ UPF by independent testing. To learn more about AATCC testing, go to www.aatcc.org.